How is that some people are able to make unremarkable outfits—a pair of blue jeans, a flannel jacket, a gray t-shirt, a pair of white sneakers—look so unbearably chic? I’ve long felt this way about certain mixed-fermentation or farmhouse beers, too. While they’re ostensibly provincial and rustic, many have a tangible sophistication, a refinement that’s even more alluring given their cliché haystacks-and-wheat-fields trappings. It’s difficult to write about farmhouse beers—I’ve probably underrepresented them in my Beer Of The Week coverage—for several reasons. First, because their vocabulary is especially thorny. I used the term “farmhouse” above because that’s what’s on the label of the specific beer I’m writing about—Jolly Pumpkin’s Bam Bière—but unless I’m talking about a brewery that’s on an actual farm, I generally prefer the term mixed-fermentation beer. I feel it’s more accurate and better explains the character of these beers. They’re fermented not with straight brewer’s yeast (saccharomyces), but by yeast like Brettanomyces and assorted bacteria commonly including lactobacillus and pediococcus, which lend mixed-fermentation beers their tartness, funk, earthiness, acidity, and other special characteristics. See? We had to spend a whole paragraph discussing nomenclature before we even got to the beer I’m focusing on today. And there’s more that’s tricky when writing about so-called farmhouse beers; they’re often brewed in small batches and released locally. It’s rare to find a farmhouse beer here in Montana that you could also buy in say, Decatur, Illinois. But I think this week I’ve found it: Bam Bière. Bam is a prime example of that sophistication I mentioned before, and it’s available in almost all 50 states. I was lucky to first drink this beer almost a decade ago, early on in my craft-beer education. Bam reminded me of some of the Belgian saisons I was just discovering, but it was from here—the decidedly un-European locale of Dexter, Michigan. At the time, I didn’t realize American beers could taste like this: effervescent, nimble, clean, elegant, refined. It tasted like the progeny of champagne and wheat beer, and it still tastes just as impressive to me now as it did then. Some people back when I was first drinking mixed-fermentation beer referred to them all as “sour beers,” and plenty of people still do. John Laffler, of Chicago’s Off Color Brewing, explains why that’s problematic, if you want further reading material. But Bam isn’t sour so much as it is lightly citrusy-acidic, with a lime zest tartness that tastes like the first warm ray of spring sun feels when there’s still snow on the ground. 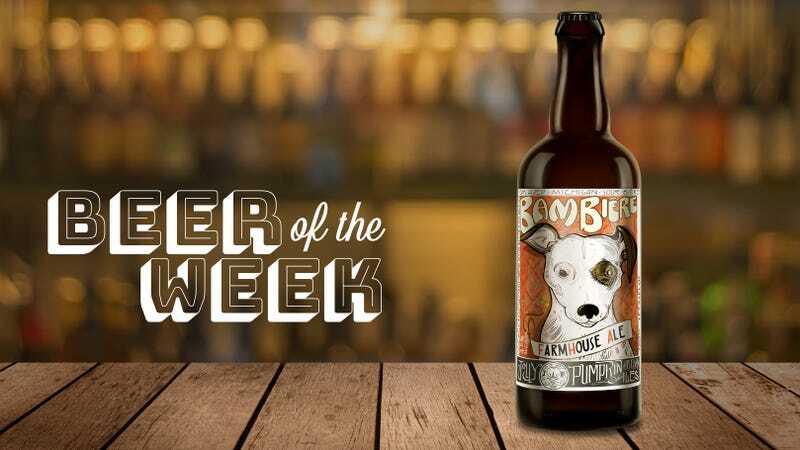 There’s a vinous quality to the sip as well, a white grape skin note that combines with tannins from the oak barrels in which this beer ages to give the impression of a fumé blanc. But stay with me. For all the heady tasting notes I just gave you, this beer isn’t one that you have to sit down, swirl, and contemplate. (Only I do that.) It’s a svelte 4.5 percent ABV, with a texture thinned out by lively carbonation. You could drink it like a white-wine spritz, really, while sitting at a picnic or grilling seafood. It’s so easy-drinking that I poured myself a glass to conduct my tasting, then poured a little more, then had suddenly gone through nearly the entire bottle. Sneaky Bam. This beer is available at a grocery store near me, which is lucky because it’s the perfect bottle to have on hand for spring and summer parties. It’s “fancy” enough to serve to company, but also an easy crowd-pleaser. It’s also low enough in alcohol that I’d open it on a weeknight if I wanted a great food-friendly beer. There’s really no reason not to have a bottle of Bam on hand as the weather warms; you can share mine if I don’t finish it myself first. Jolly Pumpkin Bam Bière is brewed year round and distributed to almost all 50 states. Find your state’s distributor here.